Okay, okay, although I'd love to believe that you're all here to see little old me...I know what you're really here for. You want in on some of this VANISH cover action don't you? Yup, you're here for some eye candy. So let me give it to you sooner than later shall I? GASP, right? Isn't it just so lovely that you want to make out with it? Or is that just me....sorry. I'm in LOVE! Now that you're in gorgeous cover shock, and possibly twitching on the floor due to entirely too much beauteous Jacinda love, let me share the official book summary with you as well! Yes, yes it is awesome. Please tell me I'm not the only one who is simply dying of impatience for this book to show up on shelves? ACK! Go forth and share! PLEASE! Take this cover, post it to the ends of the Earth. It's beauty should not be allowed to be hidden. NOW STOP STARING AND LOOK HERE. Yes I'm sorry, I pulled you away. I promise it is for a great reason though! We have, up for grabs, three signed copies of FIRELIGHT for you to win! Yes, we'd love to have Vanish ARCs, but they aren't out yet. So instead Sophie has sweetly offered up some personalized copies of the book that started it all. To enter, make sure you visit the six blogs below who posted teaser pictures yesterday! You'll want to collect a word from each blog, until you have six total. That will be your entry into the giveaway. Want another entry? Figure out what order the words go in, you sleuth you! HINT: It's the tagline of the book. Three sentences. Two words each. Fill out THIS FORM to be officially entered once you've collected your words! This form is also on A Good Addiction and Books Complete Me, but they are all the same. Please enter only once no matter which blog you enter through. Comments are appreciated but not counted as entries! 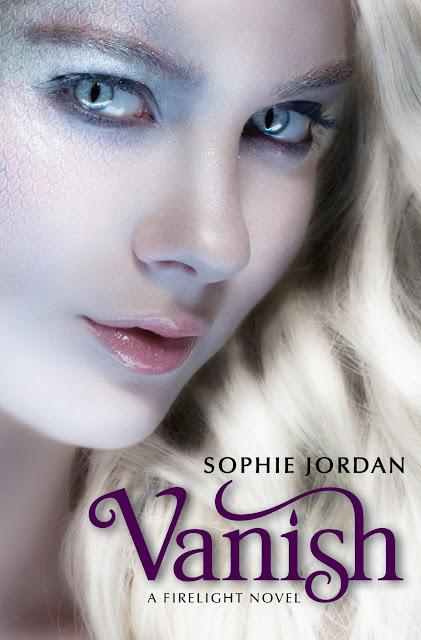 Feel free to gush over the cover and let Sophie know how awesome you really think it is! Contest is U.S./Canada only and ends March 6, 2011.